A two part exhibition, Ikyav, Píkyav: Making, Re-Making, will run from April 4 through May 18 at the Goudi’ni Gallery. 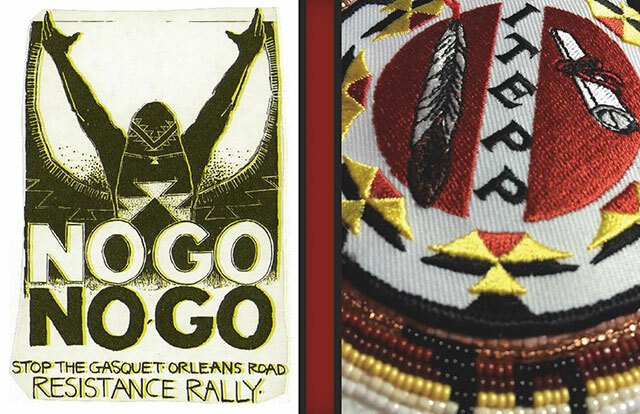 An opening reception will take place April 4 from 4:30-6:30 p.m.
NOGO poster, Frank Tuttle and Brian D. Tripp; ND and ITEPP sash (close-up)The exhibition will open with a celebration of the HSU Indian Tribal & Educational Personnel Program (ITEPP)’s 50th anniversary. Alumni’s customized graduation sashes, portraits, information, and stories will highlight ITEPP’s key moments and memories, its impact on the lives of its students, and its important presence within the HSU community as a whole. The exhibition’s second half will explore the 1970s-80s fight against the building of a road between Gasquet and Orleans, through traditional ceremonial sites of the Karuk, Yurok, and Tolowa tribes. Gallery displays will honor those who stood up against the destruction of sacred spaces and spiritual traditions, who fought back peacefully with marches, demonstrations, speeches, and tireless pleas. As a whole, this exhibition pays homage to Indigenous peoples’ reclamation of agency, sovereignty, and power, highlighting examples of making and re-making, of fixing the earth. Goudi’ni Gallery Hours: Monday closed, Tuesday and Wednesday 12–5 p.m., Thursday 12–7 p.m., Friday 12–7 p.m., Saturday and Sunday 12–5 p.m. All exhibits and events are free. Goudi’ni Native American Arts Gallery is located on the ground floor of the HSU Behavioral and Social Sciences Building, at the corner of 17th and Union Street. Find campus parking information. This exhibit is support by Instructionally Related Activities, HSU Art Department, and the Office of Diversity, Equity, and Inclusion.